Aldo Ross is a bicycle history enthusiast from Middleton, Ohio. For a while he would post pictures, primarily from old French magazines, of the main European cycling events from the 30-60's. I discovered this treasure chest when Ben sent me a link to the following picture. Soon I found out there were 571 such images, most of them with detailed captions. Over the past weeks I have made it a habit to look at some pictures before I go to sleep. They have been truly inspiring. For example, Francis Pélissier was able to get ahead by a couple of minutes at the end of the Paris-Tours race of April 18, 1921. 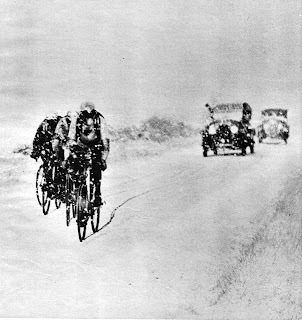 However, he soon punctured and was unable to do the repair because his hands had frozen, so he removed the tire with his teeth and rode on his rim to catch Eugène Christophe and then drop him on the climb out of Azay-le-Rideau to win. Of the 85 starters, only 8 finished the 342km race in inclement weather. See the picture below. Aldo Ross has other galleries and browsing through them has been a great experience.